I was almost certain I would dislike this dish. Funny thing, those bell peppers: I'm not a huge fan of them, and something about the idea of eating them al dente with such a mild ingredient as pasta sent chills down my spine. Fast forward to the finished product, and I absolutely LOVED this dish. 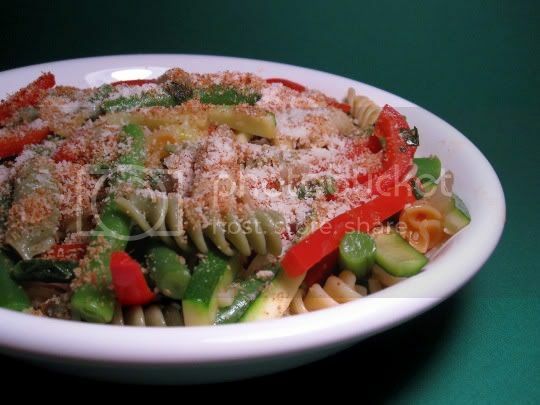 Pasta primavera, a traditional Italian dish of pasta and fresh veggies, would never really be a staple recipe in my mind...but after trying this, I may have to think twice. Parboiled green beans are sauteed with onions, garlic, zucchini, and red bell peppers in olive oil, then tossed with cooked rotini pasta. I used a tri-color variety, just for a little extra flavor and color. Crushed red pepper gives the dish a surprising amount of heat, and fresh basil and oregano add a sweetness and fragrance. The garlic was very strong (yum), and the bell peppers were surprisingly sweet. They were definitely at the flavor forefront of the dish, but they weren't overpowering the way I've found they usually are. The veggies were perfectly cooked and al dente, super fresh, crunchy, and juicy...a great contrast to the softer pasta texture. Even the ratio of pasta to veggies was perfect: there wasn't too much pasta, and not too many veggies. Hearty, yet light. Toasted breadcrumbs are sprinkled on at the end: I found these sort of dried up the dish and absorbed some of the juice from the veggies, so use sparingly. Still, they did give some crunch and crispiness. I finished my dish with a sprinkling of Parmesan, which added just the right amount of saltiness to pair with the sweet veggies (well okay, I did add a tad more salt to the veggies to bring out their flavors). One word about the serving size: the recipe suggests this dish serves six, but I found that to be closer to three or four. If you're watching calories and carbs, stick to the six-serving-size...but you'll probably want to add something else to your overall meal to complete it. Make again? Yes. I'm always glad to find recipes that spotlight an ingredient I usually don't like. Vegan variation: Omit Parmesan (or use a vegan substitute).